No, no, don’t panic, it’s not me! One of our Brown Marsh Daisies, Aino, has gone broody. It started nearly 3 weeks ago when we couldn’t collect eggs from one of the nest boxes for two days in a row as there was a hen on it. It dawned on me that it might not be bad luck (3 Brown Marsh Daisies and that nest box was everyone’s favourite). I tried to move her off and was thoroughly pecked for my efforts. Had to pick up the nest box and tip it to get her out – definitely gone broody. We briefly thought about trying to break her of the broody feeling but I was hoping to buy some more hens this summer and hatching our own gets rid of the risk of bringing in disease so we thought we’d give it a go. 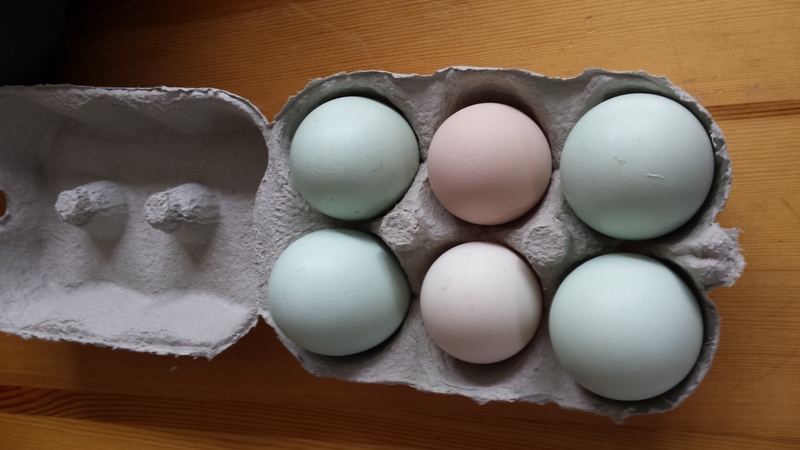 We were wanting to increase the diversity of the eggs we were producing (currently 2 blue layers, 3 cream layers and 1 darker cream layer), so we went for some Cuckoo Maran eggs. I couldn’t find any locally so we braved ebay. It wasn’t the best of experiences. Egg arrival day came and went with no eggs. 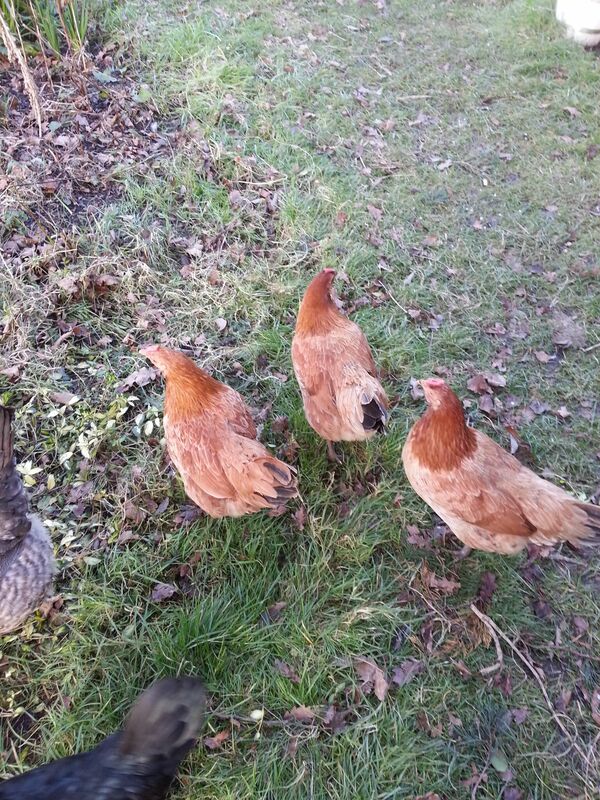 I emailed to be told the eggs hadn’t been laid yet, there were only 4 Maran eggs, not the 6 I’d paid for. The lady assumed I was incubating and figured it would be ok. I explained I had a broody and she was very apologetic, she agreed to ship the 4 Maran eggs along with some others she had. She also ended up refunding so not too bad in the end. 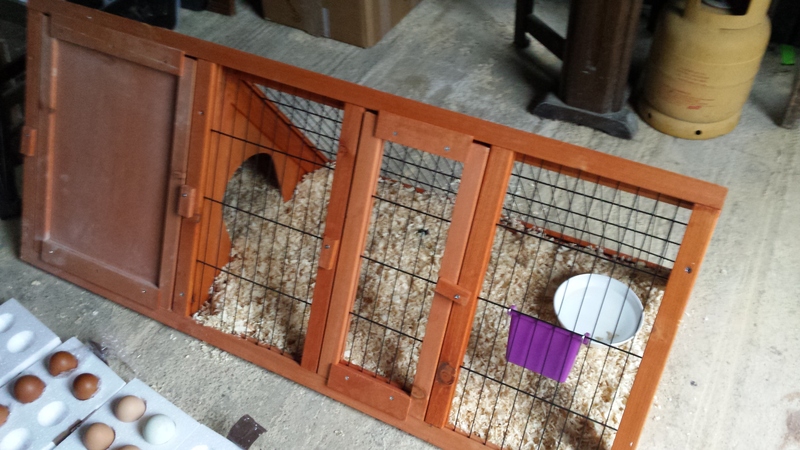 We also bought a little rabbit hutch for the broody so we could get her out of hen house and the popular nest box, we had eggs turning up left right and centre. We put the broody coop inside our big shed as it has a solid floor and we can shut it up each night in case of predators. Aino was moved into the broody coop two days before the eggs were due to arrive just to be sure she was serious about sitting. She did not want to budge! We let the eggs sit for about 8 hours when they arrived. 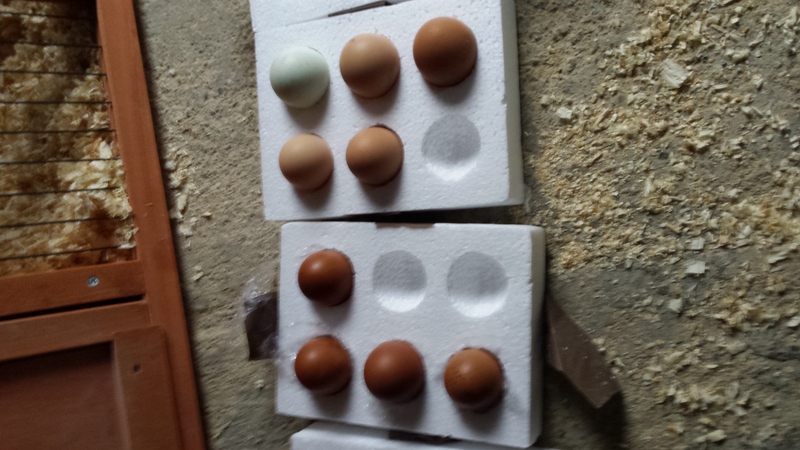 They turned out to a mix of Black Copper Maran, Cuckoo Maran x Black Copper Maran, Rhode Island Red x Black Copper Maran and Cream Leg Bar x Lakenveldar. Not really what I had wanted but I had read the advert wrong the night I ordered and the other eggs were to make up the numbers. Some of them were really large though, so if we can get a hen laying large eggs that should help, and we might end up with some interesting coloured eggs, assuming we don’t hatch all cockerels! 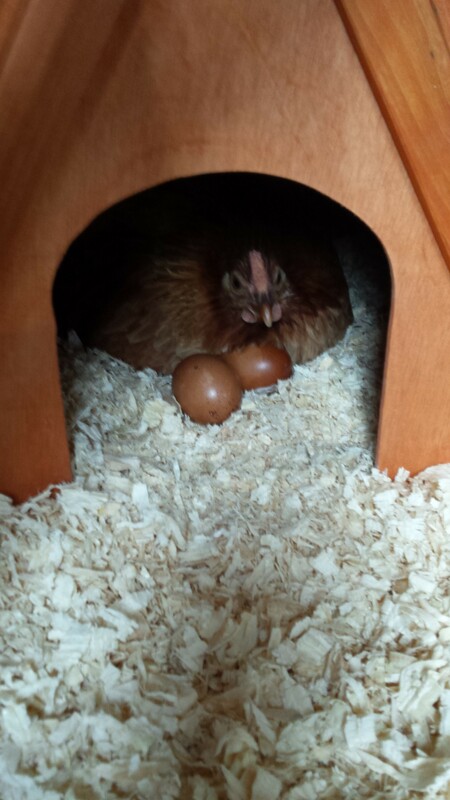 She accepted the eggs straight away although she kept having two Maran eggs peeking out from under her, sometimes feeling cold. 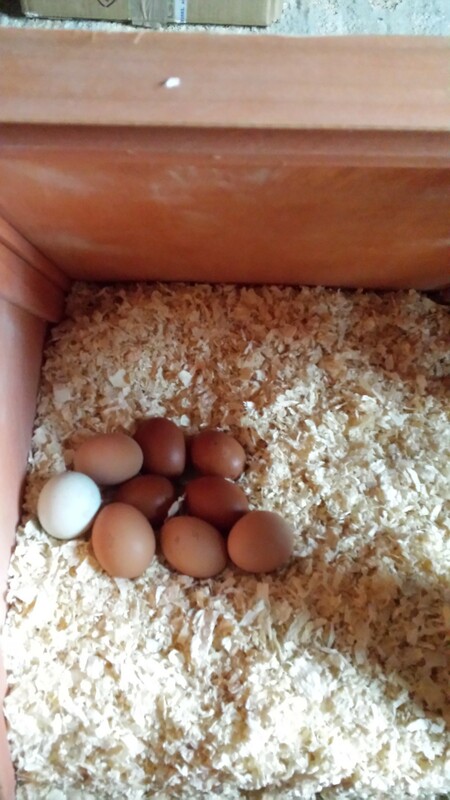 We left them as they didn’t seem to be kicked out, and of course they were 2 of the 4 Maran eggs. We bought a candler and then realised that we probably shouldn’t have started with Maran eggs as dark brown eggs are hard to see through! We couldn’t really tell with them but we saw veins with the others and a growing dark area when we candled at day 15 so fingers crossed. At day 15 when we were candling I noticed a Maran egg had some cracks so we took it away and had a look, rotten. At day 17 I noticed another Maran egg the same, rotten again. I am hoping that these were the two eggs that had been peeking out. We did number the eggs when they went under Aino, but the pencil wore off. I’m guessing these two eggs just weren’t fertile. The other two Marans seem to be ok, so fingers crossed they hatch ok and are female. The eggs are due to hatch on Saturday so watch this space, hopefully all will go well and we will be having to come up with some B names from fandom! Previous PostA wooly adventureNext PostShopping smallholder style! Currently hoping they are all healthy. Boys won’t be too bad, they’ll end up in our bellies but girls that are good layers would be better. Getting quite excited now, handled the eggs for the last time yesterday, now it is time to sit and wait.